Custom Bounce Pads are great for any business looking for attractions that can entertain large groups of kids at the same time. We are able to provide very competitive pricing making safe family entertainment more affordable than ever. 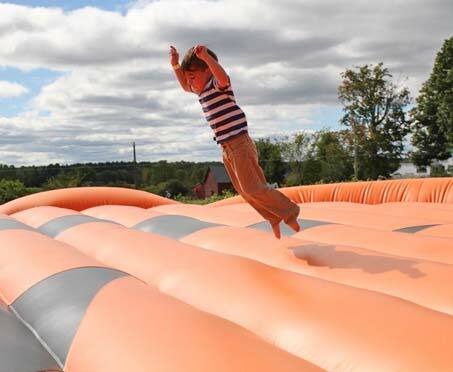 All of our jumping pillows are portable and only take a few people to set up and take down. This makes rolling the pad up nice and easy at the end of your season for storage in the offseason. Why a Custom Bounce Pad? Safety is our number one priority for all of our custom bounce pads. These pads are great for children of all sizes and ages, and with our baffled interior panels double bouncing is no longer possible. Additionally, our bounce pads are only 26″ tall to minimize potential fall risks. Contact us today to learn more and find out how a bounce pad would be perfect for your farm, campground, amusement center or anywhere else!